Fact #1: Music instruction improves phonological awareness. Early exposure to music listening helps train the ear to pick out these individual notes and rhythms. Later on as children are learning to read, this early music training helps children be able to identify the different sounds that make up words. This is why we play with words, rhythms, and sounds in Kindermusik in vocal play activities as well as focused listening activities. Fact #2: Music instruction refines auditory discrimination. As children experience and listen for tempo (fast or slow? ), dynamics (loud or soft? ), and melodies (up or down, high or low? ), they are developing the critical skill of being able to distinguish between sounds – an ability that is absolutely vital to reading. This is why entire Kindermusik lessons are focused on basic musical concepts – such as fast/slow or high/low – that are also giving children valuable practice in sound discrimination. Fact #3: Music instruction increases auditory sequencing ability. Songs and music activities often require children to remember both the detail and order of what is heard and to respond accordingly, thereby increasing the brain’s ability to organize and make sense of sound – a skill that is also required for literacy. This is why our Kindermusik story time often includes books with repetitive phrases where children are invited to repeat the phrase at the appropriate time. Fact #4: Music instruction strengthens listening and attention skills. Listening and paying attention are naturally encouraged in a music class where children are encouraged to interact with, engage in, and respond to what they are hearing in the music, rather than just passive participation. This is why our Kindermusik classes include active listening activities where children are encouraged to focus on specific sounds and then imitate those sounds. Fact #5: Music instruction enhances speaking skills. Speaking and singing are interrelated. Whenever children are encouraged to sing simple songs and repeat easy rhymes and chants, they are practicing the same skills necessary for language development and ultimately, effective communication. This is why repetition is an important part of the Kindermusik curricula. Repetition gives valuable practice, helping children gain confidence in their ability to speak and communicate. Fact #6: Music instruction heightens oral language development. In a music class, children are given many opportunities to listen and to speak. Both listening and speaking are part of oral language development, which is essential to language acquisition. This is why the Kindermusik environment is an exceptionally rich environment for language development, encouraging first words, communication, and conversation and giving opportunity for verbal interaction with parents and peers. Fact #7: Music instruction enriches vocabulary. Where else will a child be able to play with words, sing silly phrases, learn whole songs and rhymes, or be exposed to words like tempo or timbre than in a music class? Singing songs and repeating rhymes are great ways to enhance and expand a child’s vocabulary at a time when they are most receptive to such enrichment. 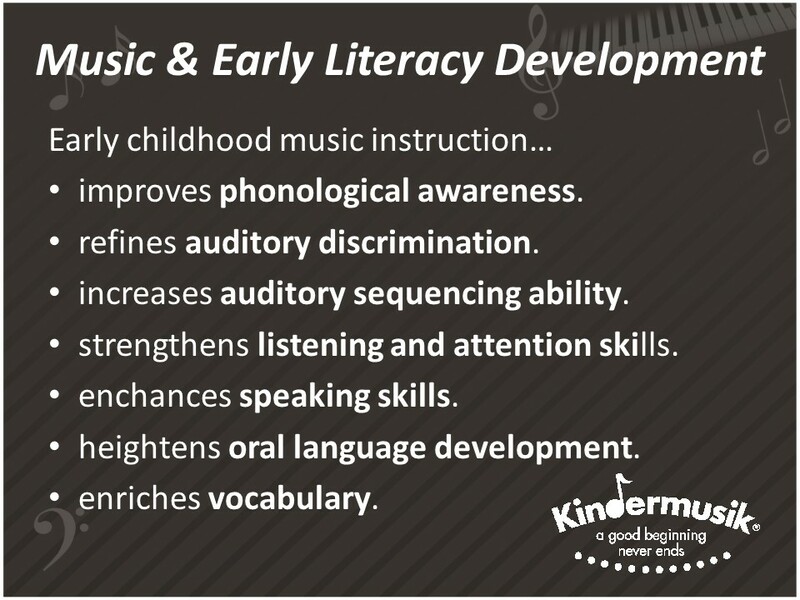 This is why Kindermusik classes are full of singing, incorporating a rich repertoire of folk songs, multi-cultural songs, beloved children’s songs, adapted or “piggy-back” songs, and even new songs. Find out more about Kindermusik at www.Kindermusik.com. Contributed by Theresa Case who has an award-winning Kindermusik program at Piano Central Studios in beautiful upstate South Carolina.